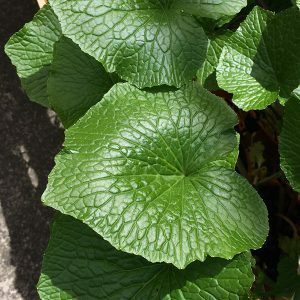 Given a cool shady position Wasabi japonica is the plant that Wasabi paste is made from. It can be grown in the home garden, and is successfully being grown commercially using hydroponics in Australia. Also grown in shaded damp positions for the attractive foliage. Grown the stem rather than the actual root, it is the above ground stem that is cut once it reaches around 2-3 cm 1 inch in width and 15 cm 6 inches in length. The wasabi flowers are also edible. Also known as the Japanese Horseradish, this is a root vegetable that is used for the foliage in fresh in salads as well as for the roots grated into salads and of course in the well know ‘wasabi paste’. Why would you grow it ? If you have ever tasted true fresh wasabi paste than you would realise that much of what if offered in supermarkets is a poor imitation often ‘bulked out’ with horseradish. True wasabi has a more delicate, but still fiery taste. Does it grow well in Australia ? Excellent in Tasmania where it is grown commercially by a dozen growers. Also grown in Victoria by 3 – 4 growers. The natural environment is in forested areas near damp areas, so this is what we are trying to recreate, a shaded, moist humid environment. 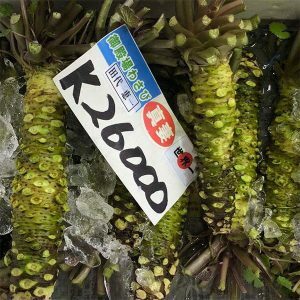 Wasabi naturally grows in river beds in water with a temperature of around 12 – 15 C, although it can be grown in soil, the resulting product is considered to be inferior when used fresh. Commercially wasabi is grown hydroponically in green houses, this allow the natural growing conditions to be more carefully mimicked. It grows beat in a cool climate, temperatures that range between 5 C and 22 C are ideal. In Australia it is generally grown under shade cloth as it requires a warm humid environment in summer, but not strong direct sun. Plant will take around 2 years to create a root or tuber worth harvesting, however the foliage is also used in salads. A relatively dry winter is required so a raised garden bed and a humus rich soil works well. Plant will send up offshoots or suckers, break these of to help with root / tuber formation. You can grow it in containers, choose a large pot with a humus rich organic potting mix. Add some extra compost and cow manure if needed. In a container try a mixture of normal potting soil, vermiculite and perlite. A position beneath large trees where good shade, and increased humidity go some way to providing the right conditions. Use a container that is at least 30 cm (12 inches) deep and the same width. Seedlings need to be around 10 cm (4 inches) apart. In the ground you will need to prepare the soil well. You do need a shaded position, beneath a tree, or use shade cloth around 80% depending on location. You need to dig the soil over well, add some vermiculite and perlite and some well rotted compost. A little cow manure as well. Dig the soil over to 30 cm (12 inches), mixing in the perlite etc as you go. The soil MUST drain well. You will need water regularly, every second day from late spring through summer. In winter, you my not need to water at all. Harvest time is usually in spring to autumn. Wasabi can be propagated from remove of offsets, from seed and also by tissue culture. Seed is the preferred method by Japanese growers. With around 20 different varieties, unless you grow from seed only one two varieties will be available, usually the Duruma and Mazuma types. Other varieties include Takai, Shimane, Midori, Sanpoo, Izawa Daruma and Medeka and Hangen. Why grow your own Wasabi ? First and foremost, to make sure it is Wasabi and not horseradish. Most os the grated and and pastes sold are actually horseradish. It is a related plant, however not the same thing. Secondly, it is freshly grated wasabi that is desired by chefs, as well as home cooks. When the stem is grated it releases a chemical that is a sort of defence mechanism. It is natures way of protecting the wasabi plant from fungal and bacterial damage if the stem is damaged. It is this chemical that gives wasabi its unique flavour. And finally, look up the 2011 lg Noble prize for chemistry, not the normal chemistry prize but the lg one.